The purpose of the Week 7 assignment is to take last week's model and interpret its results in an understandable way. We want to look at how the resulting graphics can be used to show a pattern in the data or provide us insight into the regulation of transcription factors/genes during cold response. We also want to come up with ideas for how to tweak the experiment to get more interesting or different results. Do this by summing up the rows in the network_optimized_weights sheet of this spreadsheet. In GRNsight model, HAP4 has opposite expression, ZAP1 shows no change in simulated data but activation in actual data. In GRNsight model, both YOX1 and ACE2 show activation in actual data but not simulated data, ZAP1 shows slight repression in actual data but not simulated. All nodes in GRNsight model look relatively the same between actual and simulated data. Most GRNsight nodes look similar, except for ZAP1 shows more repression in the actual data. The ZAP1 model for dzap1 does not fit the individual data points very well. YAP1 dhap4 data points seem to be slightly under the model line. Most of the model lines seem to fit the data relatively well, especially since we don't have a ton of data for each gene. Bar charts can be found on the last two pages of my Excel spreadsheet in Box. The goodness of fit of the model can be explained by how closely the bars for the optimal production rate match the productions rates from our actual data. In my model, there are about five bars that are much lower than the optimal rates. The model fits fairly well. There is a slight difference in GCR2 expression. ACE2, STB5, YOX1 show activation in actual data but repression in model. Opposite for ZAP1. Model fits well, except for ZAP1. YHP4 dzap1 model line is slightly above the actual dataset. SFP1 dhap4 model line slightly above data points. Overall, models seem to fit the actual data fairly well. 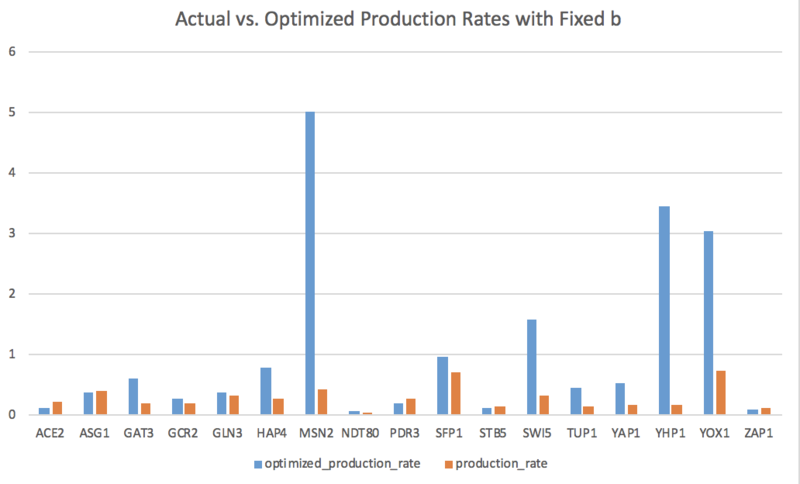 The optimized production rates are consistently higher than the actual rates, suggesting that this fixed b model may not be the best fit. Looking at the GRNsight model and individual expression plots and comparing the optimized expressions versus the actual expressions, it seems that my model is a fairly good predictor. With a LSE:minLSE ratio of 1.44, the fit of the model also seems to be fairly good. There are a few differences in specific genes between the optimized and actual values, so it would be interesting to tweak the model and see how the results may change. 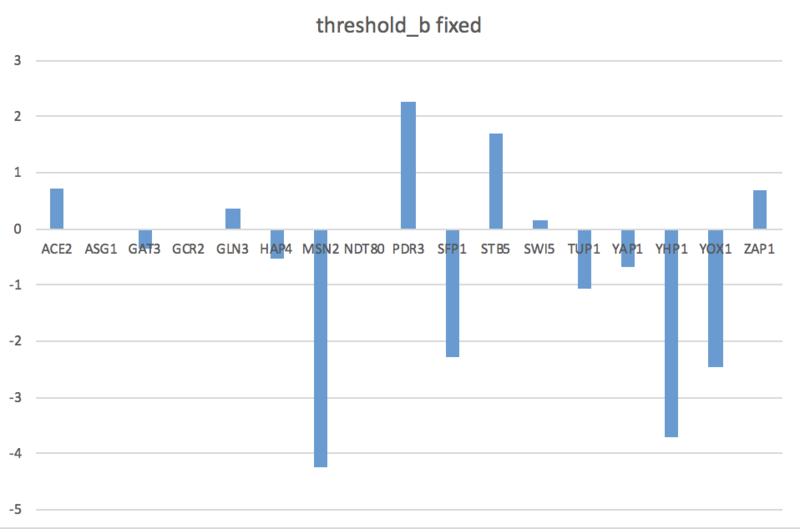 We chose to fix the threshold b values to be the sum of the weights of the controllers for each gene to see how this may affect expression. After fixing b and rerunning the model, we found that it did not change the results of the model significantly. The powerpoint made by Edward and I can be found in Box at this link. The workflow instructions were copied from the BIOL388/S19:Week 7 assignment page and personalized by me. My partner, Edward, and I worked together in class to interpret our modeling results. We also texted a few times about deadlines and results. Loyola Marymount University (5 March 2019) BIOL388/S19:Week 7. Retrieved from https://openwetware.org/wiki/BIOL388/S19:Week_7 on 5 March 2019. Loyola Marymount University (2018) GRNsight. Retrieved from http://dondi.github.io/GRNsight/ on 5 March 2019.